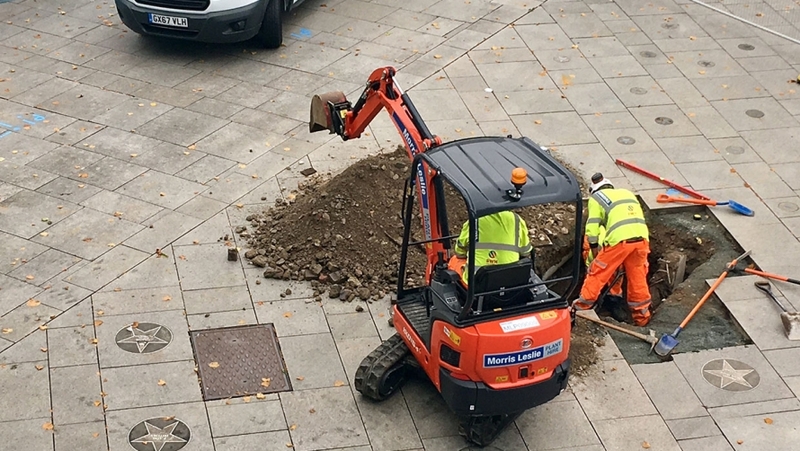 Work has begun outside the Theatre Royal Plymouth in preparation for the arrival of Plymouth’s contemporary and controversial giant bronze sculpture. Contractors have fenced off the site outside the Theatre’s main entrance, which will eventually become home to the seven-metre tall, nine-metre wide bronze female figure. Work over the next few weeks will involve excavating and installing a concrete sub-structure strong enough to hold the sculpture, which is set to weigh ten tonnes, heavier than an African bull elephant. The work includes lifting paving slabs and excavating to a safe depth before ‘piling’ work – long tubes driven into the ground – is carried out. The two sets of four piles will then be capped to provide a level platform for the sculpture’s feet to bolted onto. Once this work is completed, the paving will be re-instated until the sculpture is ready to be installed. A nearby lamppost will also be relocated to make way for the sculpture’s left foot. A bespoke lighting system, which will eventually illuminate the sculpture, designed by award-winning Plymouth firm The Pyramid Group, will also be installed. He said that while the sculpture had been commonly known by a working title, its creator, artist Joseph Hillier, would announce its formal name in due course.